I can't believe I am sitting here writing this. 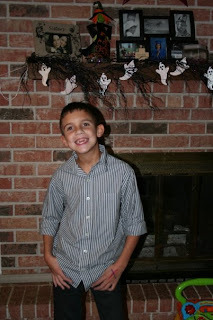 Haiden went to his first school dance last weekend. He was so excited to go, so what does a dance mean.......new clothes of course. Off we went to get him some new clothes. We had so much fun shopping, I couldn't believe it, my son having fun shopping. REALLY??? He got all dressed up and told me "mom I need Dad's cologne because he has the REAL good smelling stuff. I thought that was so funny and so cute, and ALL grown up. WOW! 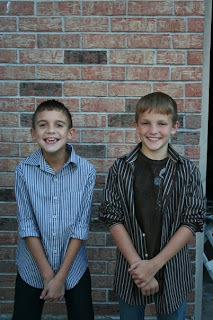 He went with a friend of his, I picked the boys up from the dance. I got all the gossip, hehe! I asked him so, who did you dance with? his response "nobody", WHAT???? He said I did dance the cupid shuffle, but otherwise I didn't dance. He then goes on to tell me, "mom, those girls, they get DOWN, I mean GET DOWN, of course telling me this and cracking up laughing at the same time. I made a comment about him being very giggly, his reply "oh yeah, they had snacks, so I ate 2 bags of chips & 3 candy bars". I just laughed and realized, he is such a guy to want to talk about the food & how much he ate. I remember walking out from picking him up with another mom (who I went to high school with) and I said, "girl, I can't even believe we are picking up our BABIES from a school dance". Man time really does fly. All in all, Haiden had a great time, and looked so handsome all dressed up & ready to go. My question is, do you think he will brag about all the snacks he ate at his senior prom??? HA!